Players are split into groups of three, with a ball in each group. Pass is then played to nearest player, who repeats the task the other way. Players to use both feet. Players to dribble with different parts of the foot. 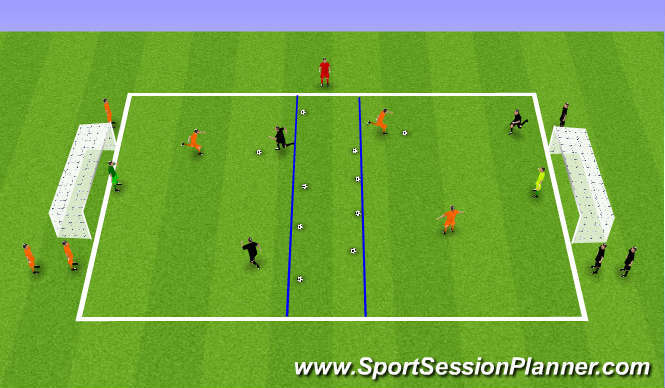 Players to move with head up, scanning and glancing whilst dribbling. Players to perform tricks and skills highlighted in technical DVD. Players to work to highest standard and tempo throughout. Blockers can be added, dribbling between groups to put players off. Players must perform turns shouted out by their team mates. A third cone can be added inbetween the two, creating an obstacle for players to avoid. 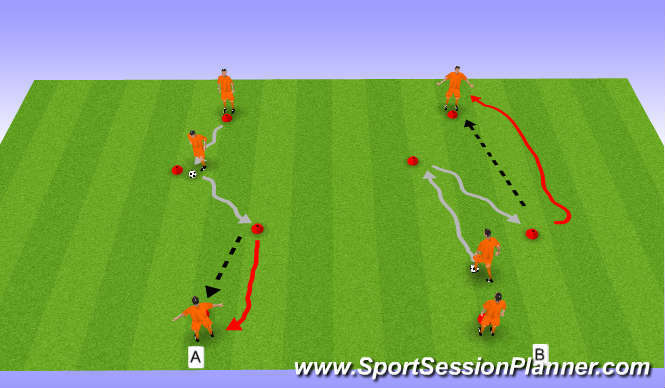 Following pass, player can apply pressure, and dribbler must beat them before starting the drill. Players rotate down one side of the Diamond only. 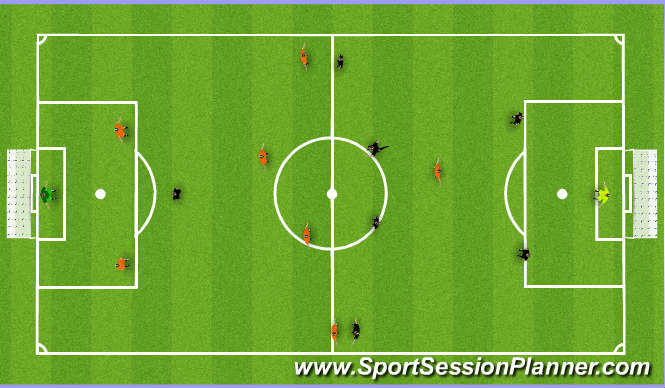 Players work both ways to practice overlapping down left side as well as down the right. Add a passive defender marking the receiver, thus affecting the decision making of the players. Add a striker who will become available for the wide player to “bounce” the ball off behind the passive defender to an overlapping player. Defensive player can play straight into forward who can then link with wide player or play one-two with defender. Two teams of six with two GK. 10 footballs (5 for each team) set up in central neutral zone. Players work in twos to attack goal. Attackers have 5 footballs to score goals with. If a goal is scored or the ball goes out of play, it is dead and attacking team must immediately go and attack with a new ball. Defenders must take it it turns to go 1 v 2 against the attackers. On regaining the ball, defenders can dribble into the central zone to get a point for their team. Two games going on simaltaniously, with scores being combined from attackers on one side and defenders on other. After five balls, practice is reset and attackers and defenders switch roles, giving everyone two goes and defending and one at attacking. 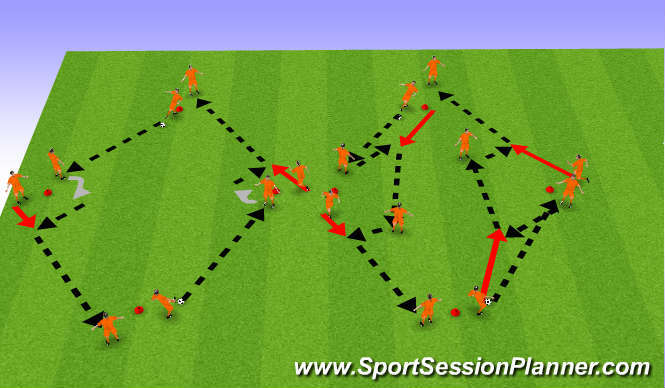 Comination play and individual ability to create goal scoring opportunies. Create space off the ball for team mate. Mini goals can be added instead of central zone for defending team to score. 2 Defenders can come out to create a balanced attack v defence practice. Game is split into two 4 minute halves. For one half one team can score in either goal, whereas the other team simply have to keep possession. At half time, the roles reverse, with the team scoring second knowing how many goals they require to win the game. Try to play around opponents with speed and accuracy.